Crank up your Portal of Power, kids. The loudmouth villain Kaos has managed to lock all of the Skylanders out of the Skylands, and you'll need join up with some familiar friends to find a way back to the Skylanders Academy, rescue Master Eon, and launch a counterattack against the Darkness. Oh, and you'll probably have to buy a few extra toys along the way. 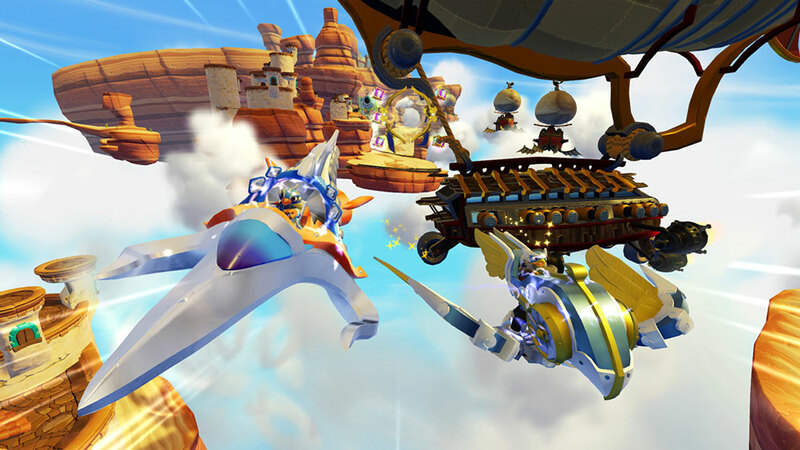 Skylanders Superchargers is my first Skylanders game and I have to comment on how the technology feels magical. My kid was going nuts when she realized she could swap figures at will and the game would react to what she did in person. I think they're onto something with this "Toys-to-Life" thing. The graphics are vibrant and all of the Skylanders (if not the secondary characters) are memorably designed. Each new entry in the Skylanders series introduces a new kind of figure, and, as the name implies, Superchargers brings vehicles to the mix. The retail version of the game comes with Hot Streak, a flaming hot rod, and Spitfire. Pairing a Skylander of the same element as a vehicle "supercharges" it and makes it much stronger. The included Spitfire figure will grant you that ability out of the box. You also get a Stealth Elf figure to round out the package and give your co-op partner someone to use. If you purchased the Wii or WiiU versions, you'll receive Bowser or Donkey Kong and their special vehicles instead. The vehicles come in three archetypes: Land, Sea, and Sky. Each one controls differently depending on context. For instance, in an arena-like area, your Land vehicle controls a bit like your character, except you have to pull the trigger to start moving. When the stages turn into a track, they control as you'd expect any racing game to. Sea vehicles feel similar to the Land vehicles, though you can dive underwater and leap out like a dolphin. The Air vehicles feel very similar to Star Fox, mostly taking place in on-rails sequences or a large circular arena for bigger fights. Your vehicles can be upgraded by finding parts throughout the game's stages, granting an altered appearance and some buffed stats. You can also improve their armor and damage output if you so desire. When not in a vehicle, the game is a fairly standard beat-em-up with some platforming and RPG-lite mechanics, but you'll spend a bit more time in the vehicles than on foot. As far as the campaign goes, only about half of it seems accessible out of the box since you have to purchase Sea or Air vehicles separately. The story mode is broken up into discrete worlds, each including at least one stage for each vehicle type. You're not stopped from progressing the story by not having a certain vehicle type, but the subtle reminder that you need to purchase something is there. Other games in the series have locked side areas out if you didn't have certain Skylanders, so this is a bit of a change.